Personalization Advantage In On-Demand Markets: Direct Sales Or Retail? The economy is going on-demand, following consumers’ desire for immediate delivery of whatever they want. The sales landscape is erupting with innovation like Kilauea volcano, wiping out businesses that fail to adapt. 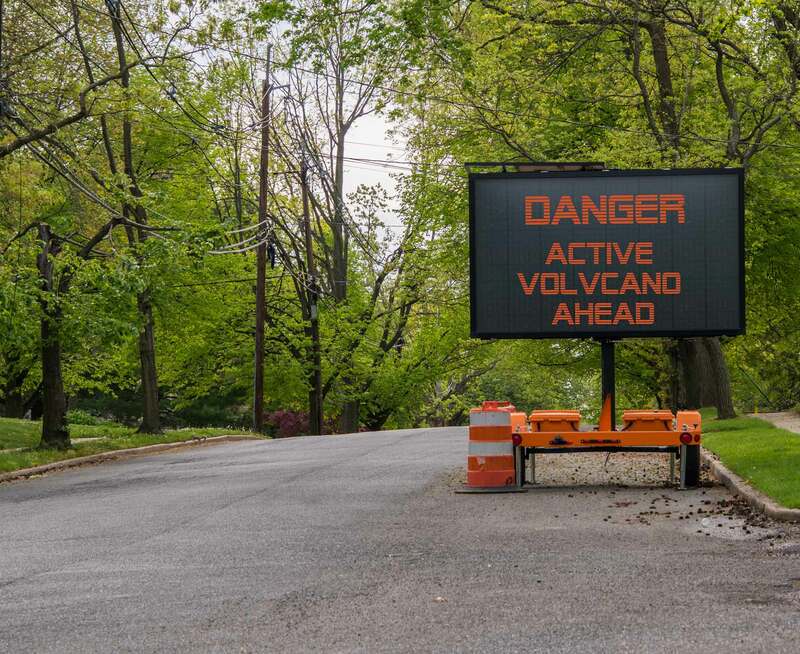 The way out of the swath of destruction is personalization based on consistent content marketing and sales messaging. Is your company in the path of creative destruction or leading the way with technology to rapidly personalize messaging, test results, and share best practices across the organization? Consumers have embraced personalization of sales experience, as well as product and services delivery to the home. They are also seeking more home-based work opportunities. More than 44 percent of Americans are adding side-work, or “gigs,” to enhance their income. More consumers welcome local expertise when considering a purchase and more people will be seeking part-time work. On-demand markets create both growth and distributor-development opportunities for direct selling brands. The flexible and in-home business model is becoming the norm. Retailers, including Amazon, Facebook, and Walmart, are moving rapidly to bring the customer journey into the home, too. Amazon has begun deploying the Alexa voice infrastructure to facilitate in-home ordering, digital locks to provide secure home delivery, and, even, offer medical services. Facebook partnered last week with on-demand home services companies Porch, HomeAdvisor, and Handy.com to offer in-home services tied to products sold and delivered to the consumer. WalMart this week introduced Jetblack, a text messaging order service that will bring products to the customer’s home in hours in hours. Direct selling and retail brands both face the onslaught of e-commerce, which is eroding the advantage of physical retail as pre-sales customer interaction shifts to digital devices. Trade and business publications frequently announce the end of retail, a claim that should be seen in context: e-commerce accounts for only 10 percent of U.S. retail revenue in 2018, according to eMarketer.com. For example, Amazon reportedly “owns” 90 percent or more of online sales in home improvement tools, skin care, batteries, golf, and kitchen and dining accessories as of early 2018. However, as a share of the total market, Amazon converts only 10 percent of sales in these categories. There is plenty of maneuvering room to counter e-commerce with personalized sales and service in the physical world. Resisting the change, though, will lead many companies into dead-ends. Sales experience is fragmenting due to the rise of technology, particularly mobile phones, and the consumer’s developing sophistication and dependence on social influence when buying. Direct sellers and retailers alike will eventually follow food delivery, home services, and e-commerce into intimate relationships with the customer that start and end in the home. Direct sales companies cannot allow retail to get ahead in the race for individual customer experience. One-to-one selling remains a necessary part of the sales process. Face-to-face selling is still alive and well, but it cannot ignore the digital personalization challenge. No longer will a single sales message work for every customer. Direct sellers, who enjoy the advantage of building on personal relationships, will need to craft their messages to deliver better customer experience than retail. Since retailers must first attract customers to their stories, direct-selling strategies are advantaged in the social marketplace. Distributors can develop friendships online to grow their business and forge strong local communities on Facebook, Pinterest, Instagram, and other social networks with the same level of investment of time as a major brand. 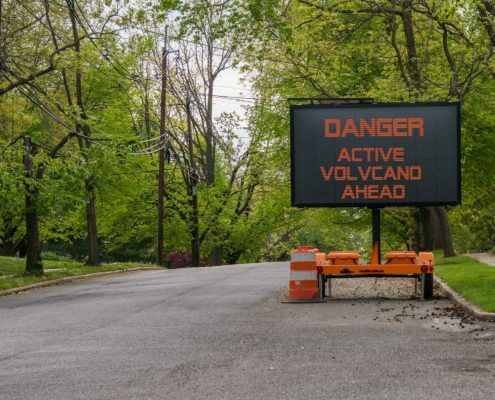 The online threat, nevertheless, is existential for consumer products and services companies that fail to recognize change and invest to build personalized and one-to-one customer experience. 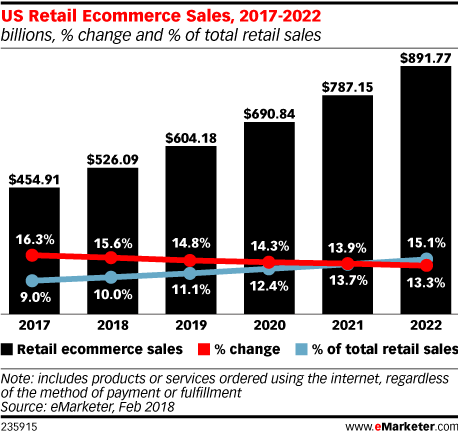 eCommerce will reach 15.1 percent market share by 2021, claiming an additional $365.68 billion in revenue, mostly from retail stories. Recognizing that they could be consumed by the digital lava rolling through Main Street in cities and town around the world, retailers are not standing still or playing golf in the volcanic smog. Retailers are leading the charge into artificial intelligence to win a personalization advantage, spending the largest amount of any industry, $3.4 billion in 2018 on cognitive systems to augment their online and in-store marketing, according to market research firm IDC. The Boston Consulting Group reports that retailer expectations for personalization are very high. In a survey conducted during 2017 by the firm, two-thirds of respondents said they will see a six percent increase in revenue from personalization spending. Half of the respondent retailers with more than 25 employees said they were putting at least $5 million into the machine learning technology last year. Both direct selling and retail will depend more on personalization to convert sales as mobile-native generations age and become the largest group of workers. Direct sales’ challenge is to stay in front of digital marketing efforts by retailers, which can be accomplished by building best practices within an organization and disseminating them using automation. Pre-sales communication, starting online or in-person, must become a focus of investment to ensure messaging is consistent and relevant. Using machine learning, an enterprise content platform can analyze messages and propagate successful content and sales steps to sales representatives using mobile devices. Brand discovery also increasingly takes place online. Direct selling marketers must develop campaigns that drive and qualify leads. Content platforms then hand leads off to representatives using automated sales process coaching to deliver all the context to present a personalized experience to the prospect. From the first to the last, every touch must reinforce the brand message to successfully close a sale and establish a long-term customer relationship. Consumers today do more research, check facts and customer reviews, as well as depend on conversational confirmation of their buying decisions than any previous generation. Often, engaging with a brand, retailer, or distributor is the last step in the process. Marketers can respond with better pre-sales content that develops trust with consistent messaging through the entire customer journey. Machine learning-coached sales reps can step into the digital engagement at critical moments to add the human element that establishes trust, something retailers cannot do during their sales process today. Feedback captured by representatives sitting with the customer gives the smart platform hints about how to personalize the experience, refining the suggested content to share and messages the distributor can use to move the sale forward. The foundation for a consistent brand message begins with mapping every touchpoint in the sales journey, from pre-sales and discovery through content marketing and sales process steps. The “attribution modeling” process allows management to identify what it expects will happen at each step and, using a machine learning-content platform, rapidly test and revise messages. Instead of launching content one or twice a year, then waiting to see its impact on sales in quarterly or annual results, it can be adjusted as fast as software updates are today. The speed of software is the new pace of sales in the era of personalization. Companies are beginning to adjust to this accelerated communications cadence, and the tools for in-home personalization are catching up to web-only interactions. The combination of digital and personal engagement is a breakthrough moment in sales. Personalization is the path out danger for retailers and direct sellers that don’t want to wait for the lava of change to erupt under them. For now, the one-to-one selling community has a sustained advantage over retailers who must attract the customer to their stores. If retailers’ investment in machine learning and personalization goes unchecked, direct selling could fall behind despite their strong foothold in consumers’ homes. https://gigeconomygroup.com/wp-content/uploads/2018/06/Personalized.jpg 1320 1980 Gig Economy Group /wp-content/uploads/2018/03/clear.png Gig Economy Group2018-06-02 02:17:062018-12-15 17:30:43Personalization Advantage In On-Demand Markets: Direct Sales Or Retail? Every week sees a new “peak” or “maximally absurd” on-demand economy story, and this was no exception. As I rundown of recent news and data points of interest to on-demand companies, investors, and workers, I keep in mind that this transformation of our economy remains controversial. It’s a commonplace to argue that “We get the society we’re born into,” but in this era, we can redesign society during our lifetimes. The vast majority of human generations have been stuck in their times because of the slow advance of knowledge and technology. The on-demand economy is only one aspect of a renegotiation of social value, and it can do far better than the first generation of companies if we keep worker retention based on fairness. We need to argue about this passionately and patiently to evolve a more sustainable and equitable economy in the era of technological acceleration. 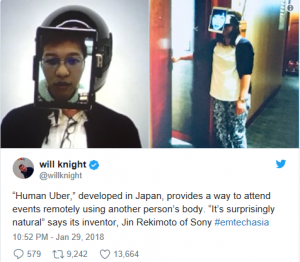 Send your “Human Uber” instead of going yourself. New York Magazine points to the announcement that Japanese researchers have developed an iPad-based solution to sending someone in your stead. Dubbed a “human Uber” and announced at an MIT form, this may be the most ridiculous and dehumanizing gig economy idea yet, as proved by an Arrested Development running gag based on the idea during its first run on television. Slapping an iPad over a person’s face to send them to be present for you is stupid and dehumanizing. The joke on Arrested Development revolved around a rich man sending a shlub to attend meetings while he was in prison. Telepresence, on the other hand, makes sense. Scott Hanselman, a former colleague at Microsoft, accomplished a proxy presence without subjecting a human to serving as a meat puppet. Scott worked remotely, sending “Hanselbot,” a rolling platform with a screen, to meetings in Redmond. We don’t need to subject people to this. Doctors on-demand, that makes sense. Lexology has a good summary of the risks associated with on-demand approaches to healthcare. In addition to the employment risks, such as failing to validate citizenship of workers and changes to healthcare organizational structure, which the articles covers, the rigors of HIPAA compliance, medical privacy, and care standards for non-employee workers are critical to understanding this market. Accenture projected that healthcare investments in on-demand would eclipse $1 billion in 2017. Josephine announced it will be shutting down in March. Founder Charley Wang, co-founder of the Oakland-based community cooking service, announced the move on the company’s blog Thursday. “We knew that Josephine was an ambitious idea from day one and, as you all know, there have been many highs and lows over the years,” Wang wrote. 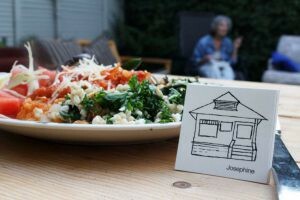 “At this point, our team has simply run out of the resources to continue to drive the legislative change, business innovation, and broader cultural shift needed to build this business.” Enabling neighbors to cook for one another, Josephine invested in changing California law to allow home-based cooks to sell their food. The site will operate for 60 days, free to the cooks. Wang also said Josephine will transfer cooks’ business information and recommendations for next steps to their members. Centralized kitchens bets are growing. Kitchen United, a Pasadena kitchen designed to support restaurant delivery and catering services, raised additional funding this month, according to Pasadena Business Now. Combining food preparation with order and delivery infrastructure, the company offers kitchen space by the hour or month to restaurants. For what it’s worth, the Global Online On-Demand Food Delivery Service Market Overview reports food delivery will grow 32 percent CAGR. Evernote CEO predicts multi-role software services for on-demand workers. In a short piece on Business News Daily, Chris O’Neill, CEO of Evernote, described an emerging software environment based on users with many work and organizational roles rather than one. He is betting his company on understanding small business’ use of services to establish networks of “products and services.” We wholeheartedly agree with this philosophy at Gig Economy Group. Integration of services will be essential to consumers, as well, because the prospect of managing multiple on-demand services through dedicated apps will be too complicated. “The biggest bid we’re making as a company is to make the product more powerful when you use it with other people, team settings, group settings, nonprofits,” O’Neill said. African household labor market points to lower marketplace fees. Workclick, a U.S.-Nigerian startup said it will take only 20 percent of worker revenue as a fee for connecting them with customers. Workclick’s app is offered in the U.S., but the workers appear to be only in Nigeria, where it has about 5,000 people on the platform. Low-income countries may be where lower marketplace fees initially take hold in on-demand work. U.S. companies like Uber have taken between 25 percent and 30 percent of revenue. In an age when Amazon and Wal-Mart thrive on sub-10 percent margins, on-demand marketplaces should expect to see their share of revenue under pressure. In low-income countries, labor marketplaces will not support high fees. Workclick’s initial fee structure hasn’t gone that far, but it’s a step in an inevitable direction for on-demand companies. Careem, the Dubai-based competitor of Uber, Didi Chuxing, and Ola, among others, is profiled by Bloomberg Businessweek. Of note: Careem, currently worth $1.2 billion, is active in 80 cities across 13 countries. Four out of five Saudi Arabian women have used the service, which is training female drivers in the country. The story does a good job of exposing the difficulties of social transformation in the Arab World. Ford takes Chariot to London. Engadget reports on the expansion of the carmaker’s first on-demand van service to the U.K. Focusing on South London, which is less well served by the Tube, with fares for daily rides between $3.41 and $2.27 after an initial two-week free offer. Allygator Shuttle, a Berlin on-demand van service, has launched. Smart Cities World describes the service as a partnership between door2door and the Allgemeiner Deutscher Automil-Club, the German auto club and driver services company. The trial will consist of 25 vans running on Fridays and Saturdays only. Another flavor of robot. They are already wandering the sidewalk in many cities, and delivery robots are evolving into specialized breeds that will take to the streets. Robomart has a concept design for a fruit-and-vegetable delivery service that brings the produce department to the consumer’s door. Robomart’s concept is a problematic model for two reasons: 1.) It depends on the customer being at home and willing to walk to a van, rain or shine, to select their produce. On-demand services will not monopolize the customer’s time like this. 2.) The produce robot will suffer from the same problem consumers identify at the store, a lack of selection if the van has been picked over by previous customers. Optimizing routes to provide stock refreshment during a day will be challenging. Crypto your tip? Finally, WIRED’s Zohar Lazar asks why Kudos, a blockchain-based system created by “Uber for buses” company Skedaddle to replace traditional tipping, makes any sense. With so many newly minted crypto billionaires, the solution to tipping isn’t to create a new currency to solve the problem, because the billionaires have a troubling habit of taking their cut first. A version of this article also appeared on Notes & Strategy for the Local On-Demand Economy. Mitch Ratcliffe is cofounder of Gig Economy Group Inc. and a veteran of tech and media startups. Uber headed off a class action lawsuit by 2,000 New York-area drivers this week, with a promise to pay $3 million to end a dispute over the fees it imposes on those drivers. It is evidence that marketplaces will see more pressure to lower fees in order to retain workers. The ridesharing company has settled many similar suits and appears headed for many more settlements. We think the underlying signals point to a decline in the advantage marketplaces had over workers which allowed fees of up to 30 percent to be deducted from fares. On-demand companies should be prepared to thrive on margins similar to retailers, such as Amazon and WalMart. Where a 25 percent or greater fee is deducted from a driver’s or a housekeeper’s earnings today, the on-demand market his headed for a sub-10 percent fee structure over the next decade. 1.) As purpose-specific marketplaces mature, such as ridesharing, workers will diversify their listings, making themselves available on many systems. This is true of Uber and Lyft drivers, who typically use both apps simultaneously to get work. This means workers will be arbitraging work opportunities across many marketplaces. Purpose-specific markets will respond by consolidating related markets, which presents significant brand challenges. “Uber” has become a verb denoting ridesharing, but not housecleaning; It would have a very difficult time extending its brand into home-services. Price is the manageable factor in consolidating markets. 2.) Information efficiency favors the consumer, not the marketplace. As more data is applied to the problem of anticipating demand, consumers and workers alike will move to low-cost marketplaces in pursuit of better prices and pay rates. These twin demands put the marketplace in a lurch. In order to lower consumer costs while retaining an attractive workforce, the marketplace must lower its fees charged to those workers. As workers diversify, marketplace providers will compete for labor supply, lowering their fees charged to workers who focus on their service categories. Likewise, consumers will embrace marketplace brands that solve many in-home and on-demand needs, leading to greater optimization within those marketplaces and lower fees charged to workers. Ford today announced a partnership with Postmates to expand on-demand services for small business at CES. Postmates reports that SMBs joining its network see “4X revenue growth” and claims it has the most extensive on-demand delivery fleet in the U.S. A variety of companies will enter this space in 2018, among them HERE Technologies which announced a competing service that aggregates on-demand mobility options yesterday. We applaud the focus on small business. It is where the on-demand economy can take root and develop opportunities in every community. Delivery without people remains problematic, as it is the last few yards or flights of stairs that presents the most significant barrier to automated deliveries. Sure, a car can get to the curb in front of an address, but how to get the package inside with the appropriate brand experience, requires a human. Postmates will likely utilize Ford autonomous vehicles to streamline its workers’ travel. The companies are working together on how to support the last-yard fulfillment, as well as improve consumer discovery of, and purchases, through automated deliveries. Several articles (New York Times, Bloomberg, and Lexology) in recent days have examined the potential for gig workers to cut their taxable income by 20 percent. There is, however, a trade-off. Workers must incorporate to gain the tax cut. Incorporating voids the argument that giggers are employees. Corporations are not employees; they operate based on mutually agreed upon contracts with another company. On-demand companies fighting regulatory scrutiny around the world are eager to resolve the question of employment status as they grow. Their future margins depend on controlling costs. The U.S. approach, to dangle a 20 percent tax break, is attractive to on-demand companies, but will it be enough for an Uber driver or TaskRabbit tasker, among many examples, to forego the employment relationship? A quick back of the napkin calculation suggests that a typical Uber driver, who earns $2,126 a month (Glassdoor reported average), or $25,512 a year, would retain as much as $5,102.40 a year. That is $425.20 more in earnings per month. It sounds pretty good. Employment has other advantages, though, that offset tax savings. Losing employer health care subsidies, for instance, can increase raise the cost of health insurance by 20 percent or much more for an individual, even an incorporated individual. A contractor who paid $1,200 for health insurance for a family of four could pay $700 more monthly. The tax break is not a guarantee of better pay for contractors who operate as an LLC or other “pass-through” entities. It makes contracting more attractive but is no silver bullet. There’s more action afoot on this front. The Department of Labor announced last week that it is considering rules to allow individuals and small business join associations to get lower insurance prices. The catch here is that the participants must be incorporated. This is a path to lowering insurance prices, not a panacea. Giggers have many decisions about their business structure ahead. In-home on-demand services will turn on voice, phone, smart TV, and PC interfaces. As reported yesterday, Google trails Amazon and Apple in installed branded hardware base. Today, Google announced new hardware partners in automotive, home appliances, cameras, and other industries. JBL, Lenovo, Sony, LG, Altec Lansing, iHome, and others joined the ranks of Google Assistant-compatible devices. Google claims Assistant is now available on 400 million devices. Availability is different, of course, than actual usage. 2018 will be a watershed year in local on-demand, particularly home delivery of food. The industry has set down roots in North America, Europe, Asia, and the Middle East. McKinsey projects 25 percent growth for food delivery companies in 2018. UberEats reportedly produced $3 billion in 2017 revenue, suggesting that its revenue could climb by as much as $750 million in sales this year. GrubHub could see more than $170 million in additional revenue. In short, there is $1 billion+ in growth revenue to be captured by food delivery companies this year. UberEats, which is driving more revenue than the company’s car services in some markets, has carved out an early advantage in prepared meals by partnering with McDonald’s and smaller local restaurants in the U.S., Europe, Asia, and elsewhere in the world. Deliveroo (restaurant delivery), GrubHub (restaurant delivery), DoorDash (restaurant delivery), Instacart (groceries), Amazon (groceries), Home Chef (meal boxes ready for cooking), Blue Apron (meal boxes), among others, are the chief competitors in UberEats’ markets. Deliveroo and Peach have invested in centralized kitchens to prepare their own and local restaurant’s recipes for delivery. Generational progress is poised to reinforce the trend. Millennials, who live at home in Depression-era numbers in their 20s and early 30s, and the 18-and-younger Gen Z, who have not had a chance to move out, are redefining the values that influence buying decisions. In particular, they want healthier, responsibly produced food and are more selective than older people, who weren’t offered as much information about their eating choices. Where older Americans order less food at home, younger people are showing early signs that they have embraced the convenience of home food delivery. Millenials eat out at restaurants more than their parents. Given the growing values-based scrutiny young consumers apply to their decisions, which may trump convenience and price when deciding what to order, differentiation of services will be essential to food delivery services. Millennials prefer to eat out — for the experience — rather than stay in. However, they haven’t entered their parenting years en masse and we can expect home delivery to displace some dining out as they age. When living with their parents, Millennials tend to buy more prepared food, notably candy, than older Americans. Gen Zers may be even more home-centric. These 18-year-olds and younger Americans save more, exercise marked resistance to impulse buying, and already represent $44 billion in discretionary spending. They also seem to impact their family’s spending more than previous generations, based on their parents’ reported spending influences. Gen Z has embraced the frugality of the times with discipline and using digital information, doing more research and tapping social sources of recommendations more than earlier generations. The quality and provenance of food, notably its sustainable production, are the levers of differentiation for these generations. Millenials and Gen Z will account for more than 60 percent of the U.S. population when they have grown to their majority. They will transform food consumption from a commodity to a values-supported experience. Food and information will be combined to delight the customer and confirm the sustainability and healthfulness of meal time. There lies the missing link: Human trust. Usability is currently the focus on food delivery platform and app experience. Simplicity, however, does not remove the tedium from selecting meals day in and day out. So much new information, from calorie counts to organic certification, is involved in choosing the next meal. Ordering for children, as well as keeping within a food budget, are just two complexities that Choosing meals is work that will be outsourced, too. The need for local curators or influencers to craft menus by customers’ personal and demographic preferences is the critical gap in this process. A story of why the food one buys and eats, that they feed to their family, is essential to food delivery success. Food choices are strongly influenced by media, by tastemakers, and chefs. Especially chefs, who are brand unto themselves these days. The Food Network and its myriad competitors prove the importance of suggested meals and stories to support consumers’ embrace of new foods and unfamiliar cuisines. A week of curated meals, based on a chef or influencer’s recommendations, will be more entertaining than searching through dishes in an app. A local food media and influencer network closely attuned to regional tastes, trends, and crop quality is the missing layer of this market. As infrastructure investment-driven growth tails off and people find the limits of their patience with meal selection tools, human contributions to the customer experience will transform food delivery from the current gradual growth rate to hockey stick adoption. But for now, $1 billion in growth makes the food delivery market a must-watch sector in 2018.